This school year was over in the blink of an eye, it feels like. I guess it means it was a good one! It also means we'll have to find activities to keep everyone busy and happy. How about making some more of these little fellows, a craft I did for our school's Spring fair. They're little magnets and very easy to make. 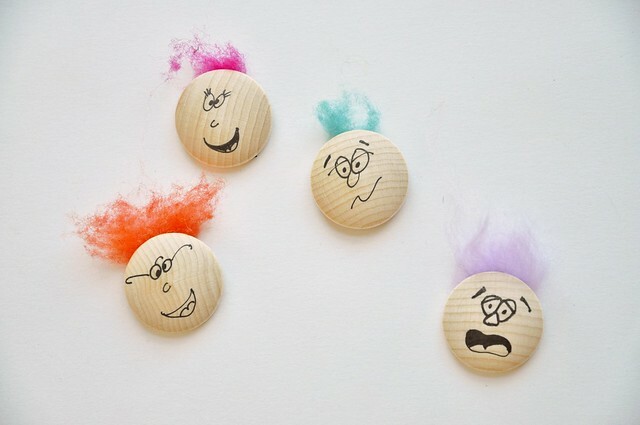 All you need is wooden disks, or any other disks/ shapes you may have at hand - recycled cardboard might do the trick - magnetic tape for the back, a black pen and a tiny bit of wool roving or yarn for the hairdo. Though I'm really not good at drawing I had a lot of fun drawing the funny faces. I practiced on a piece of paper first, which could be an activity on its own. You really need to try this - after a while you'll you get the hang of it! Have fun! !